Tag line: "From the director of one of the greatest music movies ever - The Talking Heads' STOP MAKING SENSE"
I wouldn’t call myself the biggest Neil Young fan, but I do enjoy his music (along with his striking score for Jim Jarmusch’s Dead Man, which fit that movie perfectly, Young’s 1972 album Harvest gets regular play on my iPod). 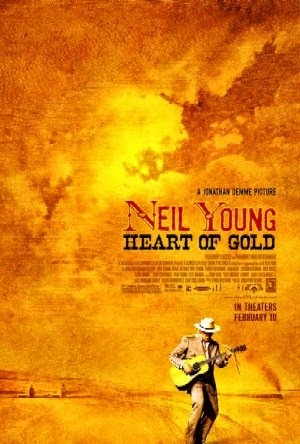 Directed by Jonathan Demme, Neil Young: Heart of Gold is a concert film shot over two nights at Nashville’s Ryman Auditorium, during which Young debuted music from his latest LP, Prairie Wind. Following a series of interviews conducted with Young and the members of his band (including backup singer Emmylou Harris), Heart of Gold takes us to opening night, with Young kicking things off with “The Painter”, the first in a series of tunes lifted from Prairie Wind. This is complemented by the singer performing a number of his classics, including “Heart of Gold”, “Old Man”, and “The Needle and the Damage Done”. But Neil Young: Heart of Gold is more than just a concert: it’s the chronicle of an artist presenting some of the most personal work of his career. According to his wife, Pegi, Prairie Wind was written at a time when Young was undergoing treatment for a brain aneurysm. As a result, he took a very sentimental approach to the album, giving many of the songs a nostalgic feel. This is further enhanced by Young himself, who, on several occasions, regales the audience with stories from his past (just before “Far From Home”, he talks of his early life on a chicken farm, and how, at the age of seven, his father gave him an Arthur Godfrey ukulele). As Pegi Young put it, Prairie Wind was, in many respects, a link to the singer’s past (“like his life flashing before his eyes”, she says at one point), and throughout Neil Young: Heart of Gold, we sense how important this music is to him. I'm really glad you covered this one Doc. "After the Gold Rush" and "Harvest" are both probably up there in my top 20 favourite albums so this is definitely something I'll have to check out!